Many people think of Southwest as a leisure-focused airline, but that’s never been the case. In fact, even in its earliest days Southwest focused on high-frequency service to be attractive to the cost-conscious business traveler. While its low fares have attracted business travelers over time, those who specialize in booking business travel for small to medium-sized businesses have long loathed the airline for how difficult it can be to, well, book. I spoke with Dave Harvey (VP Corporate Sales), Matt Smith (Sr Director Corporate Sales), and Rob Brown (Sr Director B2B Channel Strategy) to hear about how Southwest is trying to fix this. Most travelers know that if you want to book Southwest, you have to book direct. But for business travelers that’s not entirely true. Southwest does make its highest fares available through Global Distribution Systems for corporate travel agents. It also has direct connect solutions to bigger agencies. But for the small to medium-sized business (less than $2 million a year in spend), bookers are stuck using the airline’s rudimentary SWABIZ platform. On the surface, it hasn’t evolved much at all, has it? And that’s because Southwest has chronically underinvested in this product even though it’s hugely important. Dave explained that over the last couple of years, the team has been “on a mission” to understand what opportunities there would be if they focused on the corporate segment. Based on direct feedback from the travel managers and travelers, Southwest came up with a series of enhancements to SWABIZ. You will probably be surprised that some of these didn’t already exist, but it shows just how basic SWABIZ was. Since Southwest has no change fees, it’s pretty common for people to make bookings that are more speculative in nature knowing there’s no penalty in changing. When that happens, a lot of credits get generated, and someone has to keep track of them. Incredibly, organizations had no ability to keep track of available funds through SWABIZ until now. In the past, it either had to be done manually by the organization or it could have been pulled through, as Rob explained, the B2B services team. It was a manual process that doesn’t sound like it was quick or frequently used. Remember when you could book hotels on SWABIZ? That used to be powered by Orbitz, but when Orbitz was bought by Expedia, that went away. Three+ years later, hotels are finally back, and they’re powered by Booking.com. Of course, this is useless for any managed travel company since they would book elsewhere. This is primarily for the Southwest-loyal small business that wants to book everything in one place. There’s always been a reporting functionality on SWABIZ, as you’d imagine, but now there’s more detail included. Specifically, reports will now include scheduled arrival times, booking channel used, and day of travel contact info. These are things that Southwest already had, but they just weren’t included in the reports. Presumably this came about after Southwest did a bunch of research asking people what they needed more of in their reports. One of the more maddening restrictions with SWABIZ was that you couldn’t modify a booking made there via Southwest.com or on the app. That meant travelers who needed to make a quick change couldn’t just use the app to do it. And then when SWABIZ would go down for maintenance, changes couldn’t be made without calling reservations. Even more frustrating is that any discounts that were applied via SWABIZ couldn’t be applied by people on the phone. 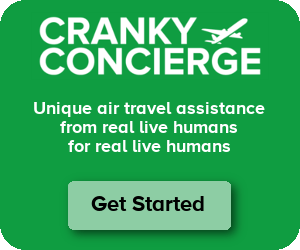 We had some real battles over that at Cranky Concierge on behalf of clients. Now, that’s all fixed. Any changes to existing reservations will keep the existing discounts that were applied originally, and the changes can be completed anywhere. When you book at SWABIZ, a receipt email gets sent to the person who books. You can share itineraries with several others, but those are more basic emails that just have itinerary details. So in the past, the only way to share that receipt email was to forward it on. Now, travel managers/agents can opt to be copied on every receipt generated while also allowing the receipt to be sent to the individual traveler. Some of these changes seem so incredibly basic that it’s remarkable they didn’t happen earlier. Yet at the same time, there are still plenty more things that need to be addressed, some pretty substantial. Dave says that there will be a “healthy dose” of investment in SWABIZ in 2019. Right now, the main goal seems to be to give SWABIZ the same basic functionality as Southwest.com. I’m certainly happy to see SWABIZ finally getting some love and attention here. It sorely needed it. Now I look forward to seeing some of these other nagging issues fixed… eventually. Until WN develops a coherent strategy for IROPS, my company will continue to avoid them. That comment confuses me. Would you prefer something akin to what American recently implemented? That is not what I meant. AA is an extreme example of an airline that has gone steadily downhill (Thanks Parker for nothing). What I meant was that many of the smaller airports in their system have only a few flights a day. If you have a cancel, you can be stuck for quite a few hours or even days trying to get on a plane. If Delta has a cancel (or United) and they can’t get you out the same day, they will look to other airlines – which WN refuses to do. Even B6 will book other airlines. And while I am going on a rant – will WN ever update its IT and website?? B6 will not rebook you on another airline. They did for a while in 2015, but that program ended quickly once the company saw how much it was spending. To pick up on the two replies already, it is a coherent strategy, it just isn’t business friendly… The accommodation being only point to point on their network is my second problem with WN (they first being they don’t fly everywhere I need to go…). For a while, WN actually did make their lowest fares available through our corporate travel site, and the company was trying to push us in their direction, but that fizzled out. The comments above simply highlight that Southwest does not do well in legacy carrier hubs other than to WN hubs/focus cities where they usually have enough service to offset other factors. Add in the limitations of WN’s corporate process which CF notes and WN is just not top of mind for business travelers with negotiated or discounted fares. WN’s 2 bag policy really doesn’t do much for business travelers who want reliable transportation. Add in that legacy carrier first class cabins do provide some chance of bennies for some passengers and WN is fine for business travelers that pay “rack rates” that are cheaper than legacy carriers or where there is a significant service advantage on WN but WN comes up short in many markets competitive with legacy carriers. Another Cranky post to bring nightmares and ghosts of the mid-80s. Picture having 4 travel school grads dedicated to WN bookings: two hammering away on the infernal (and inferior!) WN direct terminal. The other two working queues from the floor, GKing itins and Phase IVing them because (a) Sabre couldn’t price them and (b) we needed ADS to recognize/report them. Glad to see you can make changes via the app. It was always a pain going through the phone browser and digging up my SWABIZ login info. What’s remarkable to me is that “Book Direct WN” is using an OTA for hotel bookings on SWABIZ. No points, no access to negotiated rates, and (apparently) no sense of irony. No business traveler worth their salt would use booking.com. And hotels don’t want to pay the lousy 15-25%, either!